A number of customers have expressed curiousity regarding the cutting of rough material to produce gemstones. In general, only 2% of a mines production will yield material that is of value: cabbing, carving material and facet grade material. 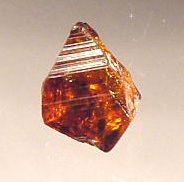 Facet grade material is a small percentage of the material that is actually mined. 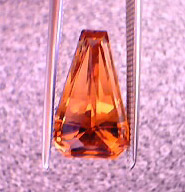 To produce a faceted gemstone, the yield is only about 20% depending on the shape, inclusions, etc. of the rough. 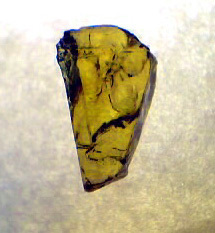 (For instance, one pays for a 10ct piece of rough and hopes to obtain a 2ct gemstone after faceting). This yield is an estimate as it can be higher or lower. 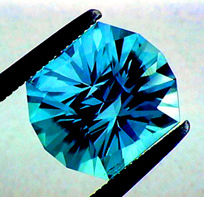 Some cutters, especially those cutting in the countries that are discovering the gem material, are cutting for weight - they want the heaviest gemstone possible from the rough. 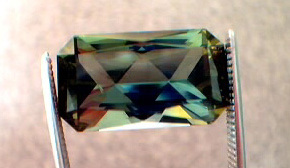 Unfortunately, the gemstone produced will not be of the best proportions and therefore, will typically not have the brilliance expected and coudl even be difficult to set due to the proportions. We typically use U.S. cutters and we are cutting at the proper angles and using the proper cutting designs to produce the best looking gemstone and therefore sacrifice weight - but the results are worth it! 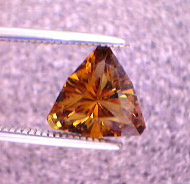 The yield can also be zero - the gemstone may crack during cutting or even after cutting. 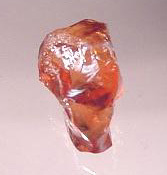 One sometimes cannot see inclusions during the purchase of the rough. The person buying the rough is actually taking a big gamble in hopes that a nice gemstone will be produced. The return is not a given - so it is obviously safer and sometimes far more economical to purchase a gemstone that has already been faceted - one already knows what one is getting. 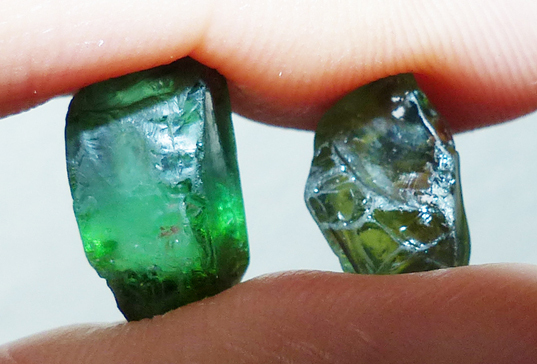 Below are some photos of our faceted gemstones and the rough from which they were cut. 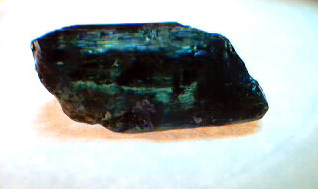 A - 3.84ct Tourmaline believed to be from Afghanistan and faceted in the U.S. by one of our cutters. A nice bright green with some blue. 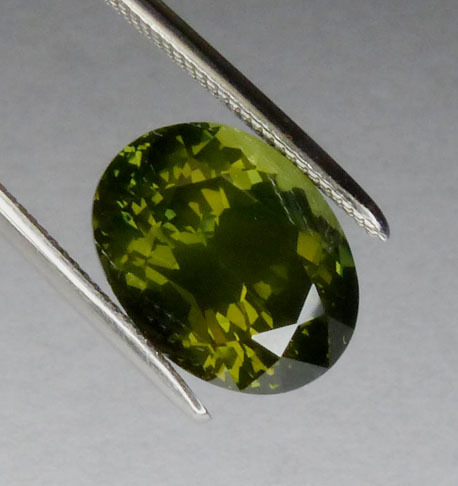 B - Large 3.50ct Oval Green Sapphire from Australia faceted in the U.S. by one of our cutters. Believed to be unheated. Slightly sleepy and described as being a Sage Green by the cutter. 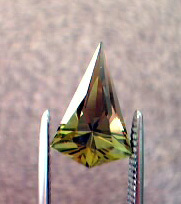 A darker gem in general, but a large Green Sapphire. It is possible that the color could improve with heat, and also possible that the sleepiness will dissipate and disappear. as well as our orignal comments on the rough prior to cutting. 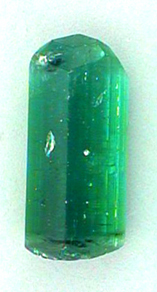 Nice Afghani Blue Tourmaline on the main cutting axis and nice bright green down the opposite axis. 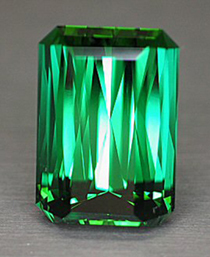 Will probably cut about a 3ct gem with a main body color of a blue and hightlights of bright green. 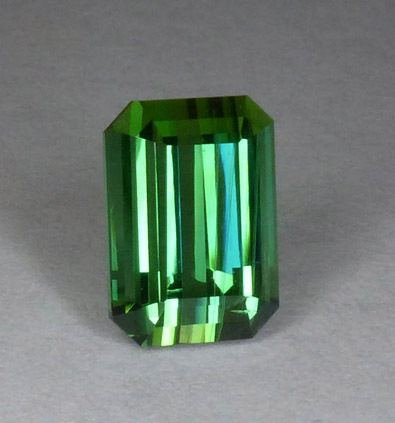 The Sapphire has a nice color for a Green Sapphire - currently unknown what it will produce in shape, weight or even final color - believed to be natural(Unheated) and from Australia. "Thank you so much for the wonderful pictures. It was wonderful to see the rough pieces of gem before cutting"